It’s Big, it’s Bad, Whiskey &/or Bourbon Barrel Aged Imperial Stout, with Coffee and Cocoa Nibs. This beer is a beast! Usually you don't see such grace and balance with bigger Stouts. From roasted, wood, booze and sweetness, it all comes together. Seriously, this one gives some of the more hyped Imperial Stouts something to think about. A true ticker, beer geek, hunter or whatever, should be seeking this brew out. The holy grail of all stouts ever created. Tastes like liquid cocoa puffs with just a little bit of coffee and booze. This one went down in just a matter of minutes, it was that good. Way better than any other stout I've had, even better than world class BCBS in my opinion. Will be buying this WHENEVER I see it. Never in a million years would I have guessed that it was 11.5% ABV. almost too easy to drink. Batch #48 I believe. The short answer is yes: it does deliver and it is worthy. Pouring the Baptist is an adventure in and of itself— the liquid settles quickly into a pitch-black pool after mocha-tinged lacing falls gracefully from the top of the glass. As if on a blind date, the beer opens up after taking the proper amount of time to get to know it. Aromas are subtle at first, but fresh-ground coffee, strong whiskey, and bitter chocolate are immediately noticeable. A few minutes after that, wood, vanilla, roasted malt, tobacco, and molasses emanate from the glass. The taste of this beer is unrivaled in many respects, as the Baptist allows the drinker to taste everything that it has to offer without tasting too much of anything. The mouthfeel is also much more intense than what would be expected of a barrel aged stout. While imparting rich flavor, barrels tend to mellow, balance, and smooth brews. This is not true of Epic’s barrel aged beauty. Swigs go down with a pleasant burn that mimics a less-intense whiskey shot. The striking taste of alcohol then fades to a lingering chocolate/tobacco aftertaste. And though I don’t remember our first encounter (nor do I remember passing through the security line at SLC), you can be assured that I won’t forget this experience. And I’ll be back for more. A: The beer is absolutely jet black in color. It poured with a two finger high dark tan head that died down a bit and left a thin layer of bubbles covering the surface and a small collar around the edge of the glass. S: There are moderately strong aromas of coffee beans n the nose along with some hints of roasted malts. T: The taste shares some similarities with the smell in terms of flavors of coffee beans and also has notes of whiskey and hints of roasted malts The roasted toffee beans linger throuh the finish and overall become stronger as the beers wrms up. O: For a beer of this strength, the alcohol is well hidden from the taste. Appearance: Pours a beautiful, completely opaque, pitch-black color with a half of a finger of chocolate-colored head that dissolved away into a thin lacing of foam that partially covered the top of the beer. Aroma: Tons of roasted malt up front, imparting notes of freshly toasted pumpernickel bread, followed by some dark chocolate aromas, caramel and brown sugar. Rich. Taste: Strong flavors of roasted malt up front, imparting notes of freshly toasted pumpernickel bread, a touch of freshly roasted coffee and smoke, followed by some dark chocolate-like bitterness, dark molasses, brown sugar-like sweetness and a touch of star anise or licorice. Delicious! Mouthfeel: Very chewy, very creamy and smooth, as there is no carbonation what-so-ever in this beer. With an ABV of 11.8%, there is a very pleasant alcohol warmth on the palate. Overall: This is an excellent beer! I love the strong flavors of malt, dark chocolate and dark molasses/brown sugar-like sweetness as well as the creamy mouthfeel. Delicious! Release # 17 - October 2013. A - Black, solid, with red-brown highlights, and slight traces of tan head. S - Barrel, booze, hints of vanilla, chocolate, and grassy hop notes. T - Following the nose, the front is a wall of whiskey booze notes, woody and full. The middle comes in with big coffee and bitter chocolate notes, acidic. Flashes of char, tobacco and ash underlie the roast core. The close is narrows to a bitter line, hops coming in here with the bitter grassiness, but mostly this is the bitterness of deeply, profoundly roasted malts and coffee. M - Silky and full, slightly oily and slick. Bitterness is present and the booze is hot and forward. This is not a beer that hides its walloping ABV. O - Don't ignore the "Big Bad" here. This is a monster beer, fat and full, ready to lay you down in the river. Drinking it is an experience, with each drink offering up new elements. A masterly brew. Pours an opaque black with a dark khaki head that settles to a film on top of the beer. Thin streaks of lace form around the glass on the drink down. Smell is absolutely fantastic with dark roasted malt, cocoa powder, and huge coffee bean and coffee ground aromas. Taste is of dark roasted malt and a flavor very similar to tiramisu that has been dusted with cocoa powder and coffee grounds. There is a nice roasty bitterness on the palate with each sip. This beer has a lower level of carbonation with a medium body. Overall, this is a good stout with an outstanding aroma but the taste just doesn't match up. Received this as an extra in trade with BA BrettHead. Enjoyed out of a 22 oz brown bomber with a production date of October 2013. Poured into an oversized 33 oz snifter. Appearance (4.0) - Pours a rich, dark brown that pretty much comes across as black. Holding it up to the light reveals some shades of charred wood brown, but it's not very capable of letting light through at all. Atop the body sits a half to three-quarters finger of mocha colored foam that provides a blanket of head with just a few places where a larger bubble has burst, revealing the dark liquid beneath. Retention is moderate and before long, that blanket has turned into an intermittently dispersed film. Lacing is almost nonexistent, save for a few speckles on the sides of the glass as I drink it down. Smell (4.0) - I'm a bit surprised at how well the coffee continues to power through 10 months later. I've never had this fresh, so I don't know how aggressive it is normally, but to me, there is just a really nice amount of the roasty brew infused into this beer. French roast and bittersweet chocolate interplay up front, and there is a hint of oak and whiskey hidden behind the pleasant bitterness from the coffee/cacao. Taste (4.0) - Here, the coffee seems to have succumbed to the extended time period, but what's left is a nice roasted highlight to the roasted grains and malts contained therein. At this point, it hits the palate with the essence of coffee, rather than being a straight-up assault of arabica. This allows the bittersweet and chocolatey goodness of the nibs to shine, providing a nice sweet counterpoint to the more astringent elements of the barrel, with notes of whiskey, vanilla and wood. Mouthfeel (3.75) - Medium-to-full bodied, with moderate-to-low carbonation. It's a bit thin, but not unpleasantly so, and that is to be expected from barrel-aged beers, I suppose. There is a lingering but pleasant bitterness on the palate after the beer is long gone. Makes for a great digestif. Overall (4.0), a really nice barrel-aged beer. I'm happy to have been able to try this one, but since it's ultimately no easier for me to get than any of my favorite, hard-to-acquire barrel-aged imperial stouts, I'm not likely to have it much moving forward. 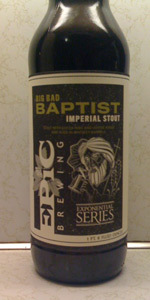 At the very least, it has me curious to try some of Epic's other offerings, as this was my first. release # 36 poured into snifter. A: jet black with a half finger of tan head. recedes to a ring around the glass with traces in the center. slight lacing. good considering 12.4 ABV according to the bottle. T: delicious. fresh coffee is upfront followed by a bit of chocolate, a hint of oaky vanilla, and just a touch of bourbon on the finish. alcohol is well hidden, though there is a slight burn on the finish. I would like just a bit more bourbon to come through. M: thick and creamy. low carbonation, as it appropriate for the style. O: this is an incredible beer. I'll definitely be seeking this out again. Very complex, and lots going on. Successive releases have toned down the complexity, and made for a much more cohesive taste. A good 20-30 minutes at room temp does so much for BBB. Jet Black appearance with minimal head. Blast of Coffee small and cocoa with little whiskey smell unless you really concentrate on knowing its supposed to be there. Shared a bomber for my bros' 21st BDay. S: Nose is great. Strong coffee, dark chocolate and whiskey barrel. T: Follows the nose, big chocolate, oak, coffee forward. Whiskey barrel is definitely present, and I really enjoy that. Pretty boozy. F: Just right. Along the same lines as KBS and Parabola. Not too thin, but not as thick as some of the same style. O: Great beer, very enjoyable, whiskey barrel becomes even more prominent with warmth. Love the big coffee and chocolate here. EBF sample. Pours syrupy and black. The beer sticks to my sample cup. Aroma is impressive. Coffee and chocolate, both very bold. Maybe a little bit of dark fruit. The flavor is immense and filled with bitter coffee and espresso along with dark chocolate. Faint dark fruit. It's mostly a big one-two punch of coffee and chocolate but it's done very well. Espresso bean finish. Full, thick and oily feel. Some alcohol heat. Great feel with lingering bitterness. I wish I had this on my radar earlier. 22 ounce into a snifter, release #40, 11.5%, maybe batch 1977 bottled 10/13/2014. Pours dark, no head but lacing on the sides while drinking. Smells oaky, vanilla, buttery (?). Whatever, smells really nice. Tastes of vanilla, whiskey, some oak. Get some coffee on the back end. This is beautifully blended. Really smooth drinking, almost creamy. First beer from Epic and it's a big winner. Can't get this where I live, wish I would have bought a second. Don't know if all the releases are this good, but you should buy it if you see it. Release #94 served at cellar temperature. I just can't find much in the aroma. Coffee brewing in distant part of the house and faint cocoa are all I can find. I am finding plenty more to like as sip. The dominant flavor is coffee, at the delightfully roasty finish in particular. I also love the bitter baker's chocolate throughout. The barrel character was faint enough that I probably wouldn't have identified this as a BA beer if I hadn't read the label. A - Pitch black with minimal head around the edges. Head is tan in color with good lacing. S - Sweetness and chocolate. Prunes, raisins, and some hops. T - Very sweet front with chocolate middle and a mildly bitter coffee aftertaste. M- Heavy with some carbination and alcohol burn. Nice and smooth. O - Easy drinking beer. Pleastant sweetness with tons of flavor and not much bitterness. I don't taste any alcohol, but I can feel it quickly. Overall, this is an in your face, awesome, tasty, imperial stout. I don't know why it took me so long to try this but now that I have I can't drink this enough. Simply amazing. Poured into a Duvel snifter glass. A - 4.75 - Poured an oily, pitch black color. Formed a nice finger and a half of very dark brown colored head. Low head potential, great head retention. Nice thick whisps of lacing left on the walls of the glass. S - 3.75 - Tons of roasty coffee, little traces of alcohol, but the nose is primarily dominated by coffee. T - 4.25 - Sweet cream upfront with an EXTREMELY distant note of butterscotch, possibly imparted by the whiskey barrels. Lots of dark chocolate and coffee which mingle together creating a nice bittersweet mocha flavor. The upfront sweet cream is balanced perfectly by the bittersweet finish. Would have liked a little more whiskey taste imparted by the barrel. F - 4.75 - Super rich and thick, very creamy mouthfeel. O - 4.50 - Definitely an A imperial stout, one of the better ones I've had in a long time. Stuff is a bit uncommon, but if you can get your hands on it and are a fan of the style, I highly recommend buy a couple to set back and age! Served slightly below room temp in a 10oz snifter. Great black, dense, viscous appearance on the pour. Minimal head as expected. Deep coffee, cocoa, tobacco, wood and bourbon aroma. Palate follows with an added burnt molasses and toffee sweetness which is well balanced. Earthy, tobacco, cocoa and coffee finish with rich bourbon and oak. Very well integrated and layered, like a fine dessert. Feel is dense and syrupy with somewhat low carbonation. Rich and sticky but not difficult to drink. A top-notch flavored BA stout. Better than KBS, in my opinion. Batch #63, 12.3% abv, but review applies to multiple releases sampled over the past few years. Despite the fact that Epic changes up the construction and type of coffee, Big Bad Baptist is consistently one of the most potent coffee-forward stouts around. Cacao nibs add a raw, earthy nuttiness to the aroma, but the coffee is clearly the star of the show. Some other standout coffee stouts, like Treehouse's Double Shot or Modern Times' Mega Black House, are exceptionally smooth, fragrant, and chocolaty, utilizing cold-brew to avoid introducing much additional bitterness. The handful of batches of Big Bad Baptist I've tried, on the other hand, are bold, uncompromising, dark-roasted beasts. The nibs bring chocolate balance to the finish, but there's no effort here to please anyone who isn't a coffee drinker. The influence of the barrel is to shore up the body into a full, smooth mouthfeel, only adding a touch of wood pulp and spice to the flavors. Poured from bomber into snifter. A- Thick and dark black with a small off white half finger head. Little to no carbonation present. Ample amount of lacing. S- Bourbon and coffee presence is bold and strong, just how I like this style. After the initial nose, mocha and dark chocolate are apparent. Other notes include deep roasted malts, tobacco, hints of leather, and some wood. T- The bourbon and coffee do not disappear here, as they are the driving force if this stout. Chocolates and mocha also add a nice sweetness, as do the vanilla and wood from the bourbon barrel. Very balanced and smooth. M- Full bodied stout. Not much carbonation. Goes down smoothly with a nice sweet aftertaste with a little heat. O- I loved this offering, probably one if my top 5 coffee stouts. It's hard to imagine getting much better than this, but there are just a couple I can think if that rival this. Outstanding job by Epic and I look forward to this again. Pours black with a finger of caramel-colored head. Head retention is fair with good lacing left behind. Aroma is bourbon, cocoa nibs, milk chocolate, coffee, and roasted and toasted malts. The aroma carries a hefty weight, while remaining balanced. Flavor profile is roasted and toasted malts with a splended smoothness from milk chocolate and cocoa nibs. Medium-roast coffee adds a touch of acidity, while bourbon cuts the sweetness of the chocolate. All together, it forms a beautiful symphony. Mouth feel is velvety, creamy and smooth with a thick consistency. Overall, a stout crafted with the utmost of care and skill. It carries a hefty weight with each individual note shining through, all the while remaining well balanced. Looks pitch black, small, light brown head sticking around the glass. Some alcohol legs sticking behind. Looks really nice. Smells like a mocha. Big chocolate and coffee. Cold pressed coffee, with some cream and sugar perhaps. I wouldn't prefer that sweetness in my own coffee, as I like it black, but it smells like a great chocolatey, coffee forward dessert. Upfront, the dryness from the oak, then some semi-sweet chocolate and soft vanilla, almost like a cookie. Then it goes down and the alcohol starts to tingle and lightly burn the tongue and warm the throat. Finishes very nicely and balanced. Lighter side of full bodied, more of a medium plus body. Pretty nice creaminess to it as well. Overall, if you dislike the thin mouth from KBS and maybe find the coffee to dominate the bourbon and are looking for more balance, then this is for you. Not sure why the ratings aren't more around 4.5. It likely hasn't quite met the masses yet or does not deliver that rareness factor.